Nail the street-style trend this winter with menswear that’s good looking and easy to wear. 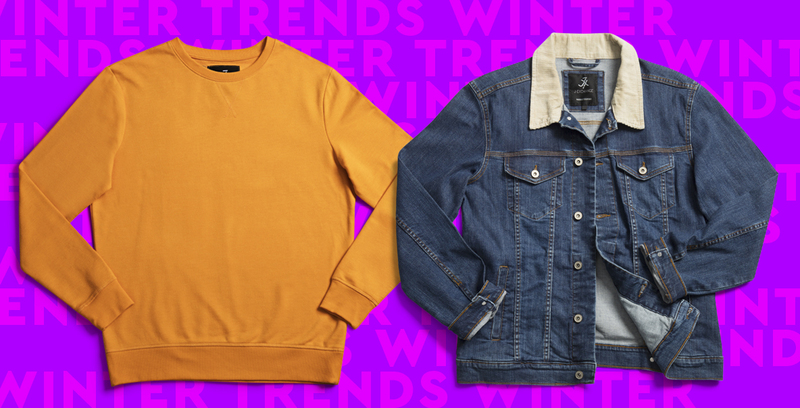 We’ve nailed down the ultimate men’s wardrobe to help you brace the chilly season without losing your cool. With just a few well-chosen items, you can transform your look to suit every occasion this winter. The bomber jacket brings the sports luxe element to street style. The identifying characteristics of a classic bomber are the ribbed cuffs, front zipped closures and defined neckline (although some styles have a hoodie). Wear your bomber over a sweatshirt with joggers or denims, and you’re good to go. A biker jacket conveys just the right amount of attitude. It always makes a strong impression and can be dressed up or down to suit the occasion. The most iconic pairing for a classic, casual look would be a white T-shirt and denim jeans. Alternatively, amp up your style and add personality to a formal look by wearing it with a suit. The cardigan is this winter’s layering essential. From preppy to sporty, there are a variety of different styles available to suit your mood and wardrobe. If you’re worried a cardi will make you look like your granddad, fear not – modern cardigans are a suave addition to your wardrobe that will keep you warm while still looking refined. A classic denim jacket is the ideal get-up-and-go winter warmer. Always on trend, this season’s denim jacket incorporates elements of fleece to keep the cold out and the style in. Wear with chinos for a smarter look, or do double denim for a casual look that’s right on-trend. Whether you want to layer your outfit or just add some style, you can’t go wrong with a crew-neck jumper. Consider it the T-shirt of the winter wardrobe. It’s a good idea to have a few of these in your wardrobe to throw on when you need an extra layer in a flash. Keep things simple and style a button-down shirt underneath for a smart-casual vibe. Slogan tops have more to offer than just self-expression – they’re also visually appealing and super easy to wear. The slogan should be the statement piece of your look, so keep bold layering to a minimum and let the trend speak for itself. Joggers are giving jeans and chinos a run for their money. With the athleisure trend continuously on the rise, joggers are now considered the must-have item in every wardrobe; and there are many ways to work the trend. Wear with a blazer and dress shoes to smarten your casual vibe, or pair with a T-shirt for effortless cool. If you think of a blazer as formal and stuffy, it’s time to rethink it. Worn with denims, a modern blazer adds a polished but trendy touch to your outfit. Wear a bold colour or patterned shirt underneath your blazer to give it some street cred. Beanies have become sought after wardrobe staples just as much for their laid-back appeal as their ability to keep out the biting cold. They come in many different shapes, sizes and fabrications, and look just as good with streetwear as with sleek wear. We recommend going for a neutral colour such as navy, black or grey to get the most wear out of your beanie. Pair with a layered look, or with the denim-on-denim trend to give your outfit an edge. The slogen top made my day. i need to get two of those..